Infant HIV diagnosis as early as possible in a child’s life followed by immediate antiretroviral treatment (ART) could stem the progressive rise in infant mortality among HIV-positive infants, particularly as several studies have suggested that an increased proportion of perinatal infections may occur in utero when maternal ART is received during pregnancy.This Project SOAR study, “Assessing the feasibility, acceptability, and costs of diagnosing HIV at birth in Lesotho and Rwanda,” leveraged two existing cohort studies to address some critical questions related to very early infant diagnosis. 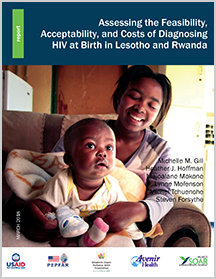 The objective was to determine the feasibility, acceptability, and costs associated with the addition of birth HIV testing to the routine testing algorithm for infants born to HIV-positive women. Findings will contribute to the global guidance on whether current early infant diagnosis guidelines should be reconsidered to add birth HIV testing as standard of care.